The purpose of the Stewardship Committee at Holy Spirit parish is to enhance and encourage the involvement of all members of the community in parish life. We seek to reach out and support our community as our members pursue active prayer lives and participation in parish ministries. We hope to give opportunities for all Catholics to grow in their faith. By each of us using our Time, Talent and Treasure, together we can experience a greater sense of belonging, involvement, and commitment to parish life at Holy Spirit. Stewardship at Holy Spirit is a way of life. It is not about money or getting volunteers. It is about living your life in a certain way. St Ignatius of Loyola famously described it in very simple terms: God created us for a reason -- to be with Him forever in heaven. He created other things on earth to help us achieve this goal. As a consequence, we should use these earthly things to grow closer to God, or remove them if they are a hinderance. One could say that the “conversion to stewardship” comes when we truly believe that everything we have should be used for God’s purposes. 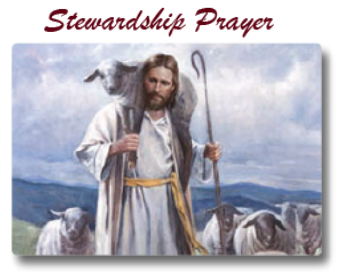 But before, during, and after you commit to a conversion of stewardship, be sure that prayer is your foundation. Without it and the grace from the Sacraments, we are incapable of leading lives back to God. Identify a prayer schedule that is manageable. This may be getting up 10-20 minutes early each day to offer your work to the Lord, or attending daily Mass once a week. Every prayer commitment is unique and personal. Yet no matter what this prayer offering is, this dedication to prayer, is key to understanding and truly believing that everything we have, our time, our treasure, our talents, should be used for God’s purposes. all that I am and gave me all that I have. gifts to serve others in your name. will come to know you through my actions. and hearts of all the men, women and young people of our parish, that we may joyfully accept your challenge to be good stewards.